The first series of the season has ended. The Mets took two out of three against a Cardinals team that’s projected to be good. Overall, the Mets played well. Let’s have a look at what went well and what did not. The most encouraging part so far has been the offense. 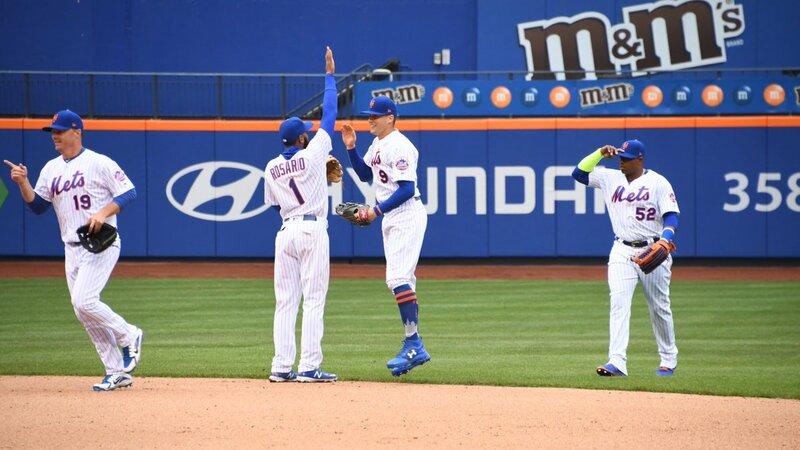 The Mets are leading the majors in OBP (.415) and are second in batting average (.306). Cespedes has been tearing it up. The catching duo hit well and even Gonzalez had some big hits after a slow spring. Following an opening day victory, deGrom pitched very well in game two. The Cardinals couldn’t muster much off of him. Familia and d’Arnaud celebrating the opening day win. The bullpen was very sharp in all three games. As a team, they have a 2.38 ERA. This is encouraging since Gsellman seems to like his role. Familia and Blevins both looked good in their multiple innings. Sewald did a good job of eating innings on Sunday. With Conforto looking like he may be back ahead of schedule, there is a lot of optimism going around. The most worrying thing to happen so far occurred in the second game. Anthony Swarzak injured his oblique. He is scheduled for an MRI and it is safe to assume he will end up on the DL for at least 10 games. Anthony Swarzak- Is he bound for the DL? In addition, Steven Matz did not look good in his first start. Before going crazy on him, it should be noted that he was battling home plate umpire C.B. Bucknor’s strike zone as well as the Cardinals batters. The second inning home run by Paul DeJong came after Matz had arguably thrown four strikes. Lastly, Jay Bruce has not done much at the plate. There is no need to panic, but he is the only everyday player who is under the Mendoza line. Thor had a bizarre start to say the least. In six innings, he put up ten strikeouts, gave up just six hits and no walks. Sounds good right? Not exactly. He was tagged for four runs including two home runs. For a guy known for keeping the ball in the park, this is odd. After all, how often do you see a guy with an ERA of 6.00 and a WHIP of 1.00? The Mets are a team built around the long ball… or so we are told. So far, we have seen them win by playing small ball. This is nice to see. However, they only have two home runs so far. This is probably because of the cold and we should not be too worried. However, if this is not a fluke we could be in for trouble. Both Syndergaard and deGrom struck at many red birds. With a three game series against a struggling Philly team, the Mets can hopefully build some momentum before heading to Washington.